Those who came before us, they were incredible, they were amazing, they were giants. They made us who we are today. They were parents, grandparents, mentors, heroes. We owe them a debt. But we can do great things because, thanks to them, we have a head start, we have a leg up, we're standing on the shoulders of giants. Chancellor is a hybrid red wine. Developed in France in the Nineteenth Century and once the most cultivated hybrid there, it was one of the many emigres to cross the pond and make its home almost exclusively in the eastern half of the United States. Here, it is best known for being smooth yet fruity. 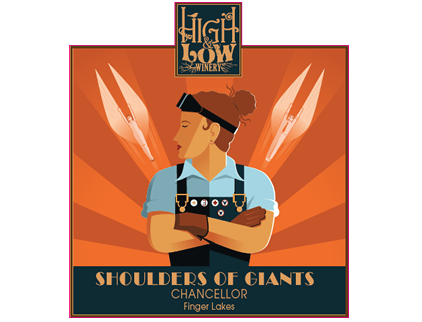 Our Chancellor proudly knows that it stands on the shoulders of giants and that this vantage point allows it to take its natural fruit forward characteristics even farther. It bursts with berry and grape flavors. A sweet red, it's best served chilled. We find that our Chancellor pairs well with burgers and other picnic fare. Or pair it with whatever you prefer, or with nothing at all! At the end of the day we like to say, Drink it, don’t overthink it.